I’ve had an admin. and fiddling about on the internet day …. what do you think of the new look? I like its pared-down, cleanness. 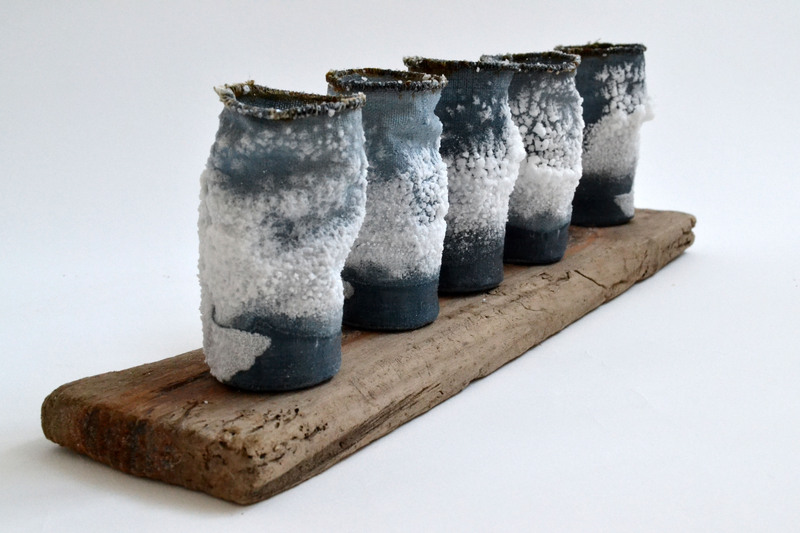 In the header you can see a glimpse of my new Blue Salts Pots. These have been sitting in salt water for the last two and a half months and have finally dried out. I was trying out a different method of soaking – instead of putting saltwater into the pots to evaporate I sat them in a container full of saltwater. The water has worked its way from the outside in rather than the inside out. I’m rather pleased with the excessive crustiness and I’m in the process of making several more. Each pot has a pebble collected from Cley beach in the bottom to act as ballast and they are all sitting on a piece of driftwood that I combed from Holkham beach. This entry was posted in Uncategorized on May 12, 2014 by debbielyddon. These are absolutely amazing! I presume the salt crystals go right through to the inside so they don’t break off? Do you have to do anything to them to prevent them absorbing moisture from the air? Hi Wendy, yes the crystals go right through the cloth. There is nothing to prevent them from absorbing moisture from the air. 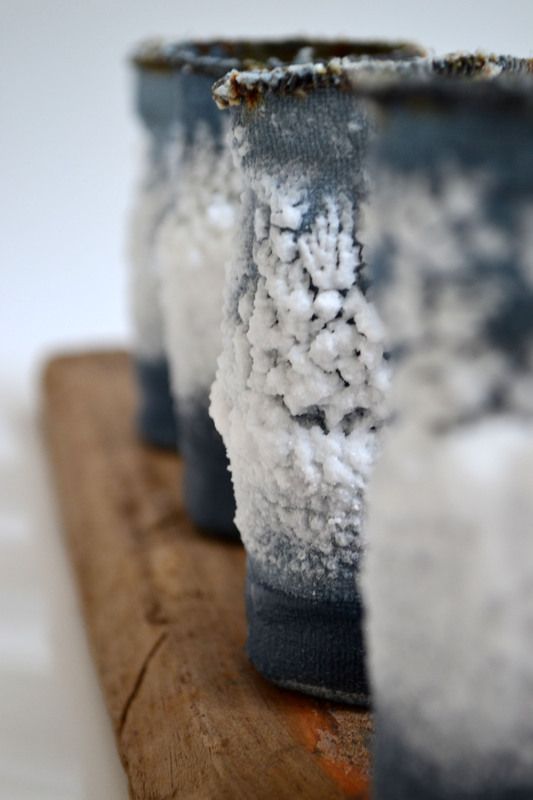 The salt returns to a dry state but in a different crystallised form, it seems remarkably stable and I think it would have to be very humid for the crystals to dissolve. They are fragile and little bits will chip off if dropped or bashed too hard – but the same could be said for a glass or porcelain pot – they are surprisingly robust!